The Dow rose 0.15 percent to 16,801.52, while the NASDAQ composite index declined 0.65 percent to 4,750.28. 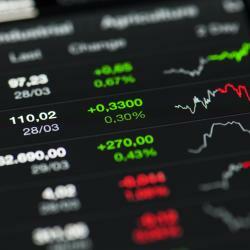 The broader Standard & Poor's 500 index slipped 0.23 percent to 1,982.57. Drug Delivery: This industry declined 4.7 percent by 11:00 am with Flamel Technologies S.A. (ADR) (NASDAQ: FLML) moving down 1 percent. Flamel Technologies shares have jumped 31.71 percent over the past 52 weeks, while the S&P 500 index has gained 2.68 percent in the same period. Health Care Plans: The industry dropped 3.7 percent by 11:00 am. The worst performer in this industry was Molina Healthcare, Inc. (NYSE: MOH), which declined 2.5 percent. Molina Healthcare is expected to report its Q3 earnings on October 29, 2015. Internet Software & Services: This industry tumbled 1.8 percent by 11:00 am. The worst stock within the industry was NetEase Inc (ADR) (NASDAQ: NTES), which fell 1.7 percent. NetEase's trailing-twelve-month ROA is 10.46 percent. Regional Airlines: This industry fell 1.7 percent by 11:00 am ET. Southwest Airlines Co (NYSE: LUV) shares dropped 2.1 percent in today's trading.